Human Gall Bladder Fibroblasts (HGBF) are derived from healthy human gall bladder. The gallbladder is located behind the liver, serves an important function in storing and enriching bile. HGBF from Cell Applications, Inc. provide an excellent model system to study gall bladder function and pathophysiology. Human Gall Bladder Fibroblasts are suitable for many cell-based assays including toxicity, drug screening and metabolism to study gall bladder function, physiology and related diseases. HGBF are cultured in Gall Bladder Fibroblast Growth Medium and can propagate to 10 population doublings when cultured under the recommended conditions. 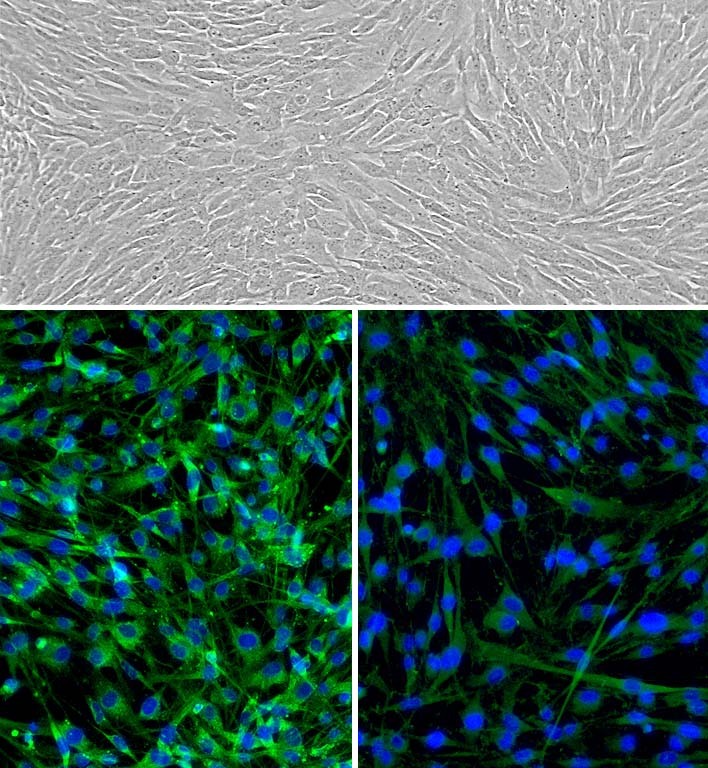 Characterization: Positive for fibroblast surface protein and fibronectin expression by ICC staining. Human Gall Bladder Fibroblasts: HGBF Top: phase contrast, Bottom left: HGBF immunolabeled for fibroblast surface protein(green), Bottom right: fibronectin (green), nuclei are stained with DAPI.